Attorney General Eric Holder and the Department of Justice on Tuesday announced their intentions to file suit against the State of Arizona and Governor Jan Brewer over SB 1070 that Brewer signed into law in April. “Setting immigration policy and enforcing immigration laws is a national responsibility. Seeking to address the issue through a patchwork of state laws will only create more problems than it solves,” Holder cited as among the many reasons to overturn the state law. But SB 1070 isn’t just a bad law; it’s a racist law with distinctly racist roots. SB 1070 was written and promoted with an enormous helping hand from FAIR (Federation for American Immigration Reform), an anti-immigration lobbying organization with a far right-wing agenda that has been deemed an immigration hate group by the Southern Poverty Law Center. There is also a San Diego twist to SB 1070: The notoriously anti-immigration Congressman, Brian Bilbray, prior to being elected to succeed Duke Cunningham in Congress in 2006, was a proud lobbyist for FAIR, and currently sits on the board of advisors for the organization. Bilbray is intimately familiar with FAIR’s stance on immigration issues, and is an ardent and wholehearted supporter of their efforts. As pointed out in the Maddow piece, FAIR was founded by known racist John Tanton. The group counts among its major benefactors the Pioneer Fund, which has contributed $1.2 million to fund FAIR’s efforts. The Pioneer Fund is a group founded in 1937. Of its main purposes upon its founding was to continue the work of Nazi eugenicists and their ongoing efforts to prove the genetic superiority of white people. At the time, the Pioneer Fund was primarily concerned with proving white genetic superiority over blacks. The original incorporation documents of the Pioneer Fund lists as one of its two primary purposes as “encouraging the propagation of those “descended predominantly from white persons who settled in the original thirteen states prior to the adoption of the Constitution of the United States and/or from related stocks, or to classes of children, the majority of whom are deemed to be so descended. FAIR has its tentacles all over the anti-immigration bill signed into law in April by Arizona governor Jan Brewer. The bill’s main sponsor, State Senator Russell Pearce, enlisted the help of attorney Kris Kobach to write the specific language of the bill. Kobach is the legal counsel for the Immigration Reform Law Institute, the legal arm of FAIR. “Nativist Attorney” Kobach has also been retained since October 2009 by notorious Maricopa County Sheriff Joe Arpaio to train the Maricopa County (AZ) Sheriff’s Office in immigration matters to the tune of $300 per hour, plus a $1500 monthly retainer, plus expenses. That is, of course, at taxpayers’ expense–Kobach’s contract, according to The Phoenix New Times, is being paid out of Maricopa County’s RICO fund, the federal money allocated to the county to combat organized crime and racketeering activities. 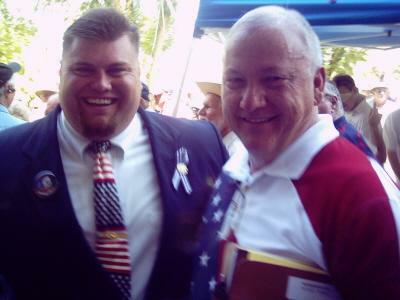 Russell Pearce–the man who enlisted Kobach’s help in writing the bill–himself has some dubious ties. In 2006 he sent an e-mail to supporters containing an article entitled “Who Rules America? The Alien Grip on our News and Entertainment Media Must Be Broken,” and a link to the article’s sponsor, the National Alliance, a white supremacist group. Pearce subsequently sent an apology e-mail, claiming that he had not read the article (which decried the “Jewish Holocaust tale” among other anti-Semitic and racist charges), and that he does not share the group’s neo-Nazi views. That’s Ready on the left, Pearce on the right. That photo was taken at an anti-immigrant rally put on by the White Knights of America, a neo-Nazi, white supremacist hate group (and who presumably took their name from Mississippi’s White Knights of the Ku Klux Klan). The forces behind the anti-immigrant bill SB 1070 can be traced directly back to FAIR. In addition to the sanctioning of racial profiling, the law provides that state agencies can be sued by any citizen for not doing enough to enforce the state’s immigration laws (as well as being too overzealous, opening state agencies to a myriad of civil rights lawsuits). And according to the research of Rachel Maddow’s crack staff, there is a provision written into the law that states that any individual or organization that brings such a suit and wins (and FAIR makes much of its money by such lawsuits) is entitled by law to recover court costs and attorney’s fees from the state. These are the driving influences behind the anti-immigration efforts in Arizona and across the United States. These are the causes championed by Rep. Brian Bilbray. These are the people he associates with (remember, Bilbray was a paid lobbyist for FAIR prior to being elected to represent the CA 50th, and currently serves on the group’s Board of Advisors). It is frightening to think that the Nazi movement is alive and well and so deeply rooted here in the U.S. It’s even more frightening to find that our elected officials–the people who are charged with protecting the rights of all citizens, white and non-white alike–are so closely tied to such extremist organizations. Jeremy Gilbert contributed to this story. That reads like a Glenn Beck episode. Ad hominem attacks, wrapped in conspiracy theories, covered with fear mongering. Ian, there you are! I was missing our resident libertarian. How are ya? Care to dispute any of the facts presented? Facts? What facts? Your whole piece is a Glennbeckesqe (sp?) conspiracy piece that tries to weave a web of racism around the law in an attempt to lambaste the law as racist (which, if you read the law, it is not). This type of junk-journalism is becoming tiring. If the federal government would do its job and stop passing the buck on immigration then AZ would not have to enact an equally out of balance draconian law to counter their laxness. This is desperation headbutting desperation. If people would stop hiring undocumented workers to do a job for pennies on the dollar over their “playing by the rules” counterparts and/or actual citizens, then maybe such problems would dissipate and be non-issues. But “quispiam nusquam” is the new American way. That’s ever apparent…. Certain politicians are standing in the way and blocking efforts by the government to be able to deal with immigration in a proper manner. They want border enforcement ONLY. The concept of and reasons behind the need for comprehensive reform are apparently too much for them to comprehend. It should also be noted that George W. Bush attempted a version of comprehensive reform, but it was Republicans in Congress that blocked it then as well. The good thing about the AZ law is that it provides the law enforcement agencies (state and local) that interact with the population on a daily basis the means to enforce the immigration laws that the Feds cannot (since they don’t have agents everywhere interacting with the population on a daily basis). The job of protecting the border should be left up to the Federal agents, but illegal immigrants do not hang out at the border, so the state and local police should have the means to apprehend someone who is here illegally, and hand them over to the proper federal agency. I must have clicked on the wrong article, this one repeatedly makes the assertion the issue is anti-immigrant. I thought Arizona’s law is about people in the country illegally, in violation of our democratically legislated immigration policy. Matter of fact if anyone says they were pro-immigration they would support the finding and exportation of those sneaking in illegally because their numbers prevent larger numbers of legal immigrants to be allowed in. I’d agree though that Bush dropped the ball and was even softer than Clinton on the issue. One reason is corporations who like to hire illegals do they can give them low pay, no benefits and they are still happy little worker drones living 5 to a one room apartment. They don’t complain either if smaller employers don’t pay into workmans comp and they get hurt. Happy little abused slaves, just glad to be in America sending half their paychecks home to Guatamala or El Salvador. The other rationale is the GOP can ill afford to make permanent enemies of the fastest growing demographic in the voter pool, so they court the hispanic vote through their faith based programs. Let’s face it, Democrats can give all the lip service they like about caring for the downtrodden and falsely assume their cause under the pretenses of racism just to indulge their desire for guilt ridden self loathing for being rich and white. At the end of the day all these Spanish speaking Roman Catholics are going to do what the good father at their local church tells them to do and preserve the sanctity of life and vote out the baby killing atheist liberals. Pretty hard to manufacture a politician more appealing than Jesus Christ or the Virgin Mary. Frankly this is why I’m amused at my mom’s own political marginalization, she’s always professed to be a liberal Democrat but as she was raised a devout Catholic and continues this at age 83 she ultimately supports Conservative Christian issues and probably doesn’t even realize this as she sends me group emails with Republican political causes on them. All the love and compassion of supposedly Democrat ideals, wage peace not war, social services, etc, wrapped up with her volunteer work with St Vincent De Paul. A lot of conflicts at the voting booth. Which is why those with ethics should vote issues and never parties.